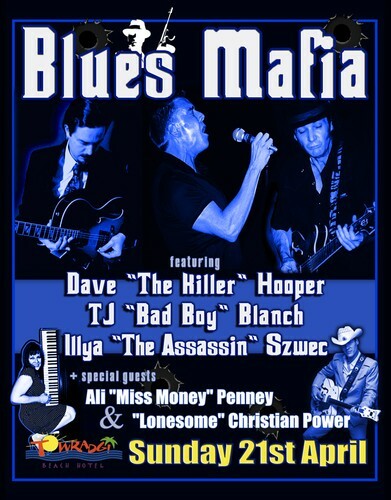 High-powered blues mafioso featuring Troy "Bad Boy" Blanch (The Villains), Dave "The Killer" Hooper (ex Blues Cowboys), and Illya "The Assassin" Szwec (Groove Depot/Robert Susz) and special guests Ali "Miss Money" Penney (The Moneymakers) and "Lonesome" Christian Power (Lonesome Train). Also, Jacob "Mental As Anything" Cook - drums, Al "Mad Dog" Ferrandino - bass. The good times will be rollin' as the band touch on the many styles of blues including chicago, swing, texas, soul and funk. Sure to be a massive all-in last set! Be there!